This year’s annual meeting of the American Academy of Dermatology attracted over 18,000 attendees, and included over 480 educational sessions from international leaders in the field of dermatology. Here I report on just a few of the new drugs, developments and research that were discussed. 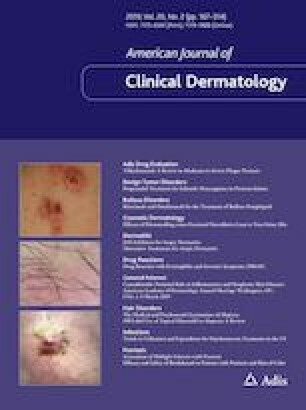 What’s New in Atopic Dermatitis? In his presentation on “New and Emerging Therapies for Atopic Dermatitis”, Dr David Cohen (New York University School of Medicine, NY, USA) discussed a number of the biologics and Janus kinase (JAK) inhibitors that are currently under development for atopic dermatitis, including lebrikizumab and tralokinumab [both anti-interleukin (IL)-13 monoclonal antibodies (mAb)], nemolizumab (an IL-31 receptor inhibitor mAb), baricitinib (a JAK1/2 inhibitor), upadacitinib and PF-04965842 (both JAK1 inhibitors), and ASN002 (a JAK/SYK inhibitor). Kathy Fraser is a salaried employee of Adis/Springer and declares no relevant conflicts of interest.